It’s March 25th. Time to leave the snowy UK and head for warmer climes to celebrate my daughter Shaunagh’s 21st birthday. It’s a five-hour flight to the capital Amman, delayed an hour on the rather functional Royal Jordanian airline. On board we experience our first taste of Arabic parenting as Mum and Dad lord it in first class, leaving the kids to scream incessantly in the row in front of us, broadly ignored by an indifferent nanny. No one seems to care much except us, mainly because they all have headphones on. The night sky reveals the coastal lights of Israel’s Haifa just before landing in a more pleasant temperature. The luggage takes a fair while as our guide explains the airport has only been open for five days. There’s a lot to cover today. First we’re off to the market town of Madaba, home of a range of Ottoman and Byzantine curiosities. Mosaics are their thing, and we look at a range of them at an archaeological site, and a rather strange map of the holy land on the floor of a knackered church. Then it’s off to Mount Nebo, supposedly the site where Moses first caught site of the Promised Land. This is essentially a large hill with views of Jerusalem, Jericho, the Dead Sea, and various other biblical hotspots, but it’s hazy and we can’t see much. Clearly it would have much greater significance to those of a religious bent. 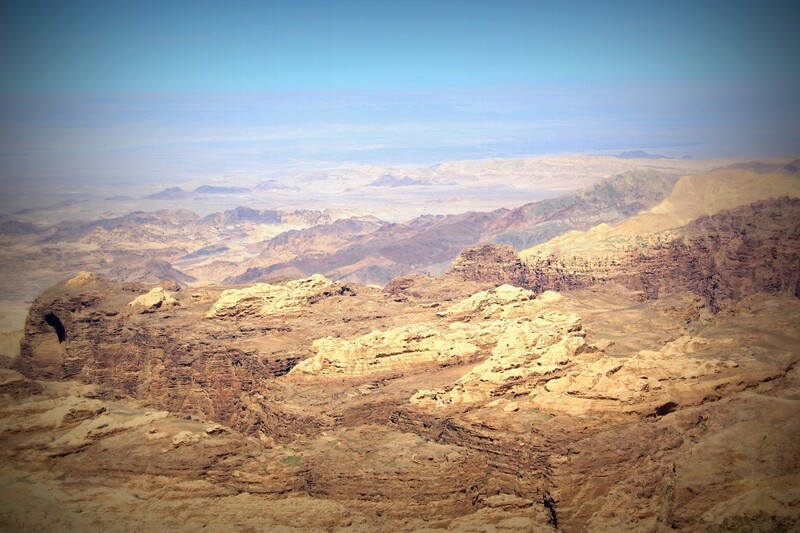 A superb lunch at Haret Jdoudna precedes a drive with dramatic scenery to Wadi Mujib – the Grand Canyon of Jordan. Here a massive gorge houses a large dam, and the road winds on to the impressive Karak castle, set extremely high on a hill by crusaders. Another two-and-a-half hours through Death Valley-like wasteland sees us arrive at Petra, home of the UNESCO world heritage site designated in 1985. The Movenpick hotel is the place to be – just a few minutes walk from the entrance. The gorge heads downhill and our guide points out how the ceramic water system ran down to supply a thriving city that once housed 80,000 people. The Bedouins always knew this place was here, but it was ‘rediscovered’ by the Swiss explorer Johann Burckhardt in 1812. Squeezing down through the narrow Siq with its vertical walls, its easy to see how it remained hidden for so long. We set off at 7.30am, which successfully allows us to avoid the screaming hordes. We have the place to ourselves, and can watch the sun lighting up the red sandstone as the day gets underway. The famous Treasury suddenly reveals itself – this is actually a royal tomb, the famous frontage that featured in Indiana Jones. Then it’s on past hundreds more of these, an amphitheatre carved out of the rock by the industrious Nabateans, and through a classic colonnaded Roman street. This fantastic stroll is all conducted in relative peace over a couple of hours and by 10.30 we are ready to climb the 1,000 steps up to the monastery. Forty minutes uphill works okay at this temperature, occasionally dodging the donkeys being slave-driven up with larger tourists on board. The views at the top are sensational, and set against a replica of the famous treasury down below. A well-earned lemon and mint cool drink allows us to observe a range of visitors, including those dressed as though entering the Foreign Legion, and some Chinese who frankly didn’t look as though they were going to make it to the top. In the Qasr al Bint, the basin restaurant provides superb respite for a slap-up lunch and beer. By this time the rest of the world has arrived – marauding gangs of schoolchildren, coach parties from Saga, and every camel-dragging hawker in the valley. It’s time to leave, and by 2.30 we are back in the hotel by the pool. We make a second trip to Petra the same day, to see it by night. Here they light hundreds of candles in front of the Treasury. It’s a longish 30-minute walk down the Siq ravine which many underestimate, and judging by the huge number of people waiting, it’s a Grand Prix start to rush down there. We opt for a pre-prandial in the hollowed out Cave Bar and then enjoy the walk on our own in peace. It’s a full strong moon and the stars are strongly in evidence. It’s heaving at the bottom and despite a request for silence to listen respectfully to the traditional Bedouin music an Italian continues to talk on his mobile whilst others do their best to block the view. We leave early and enjoy a solitary walk home. 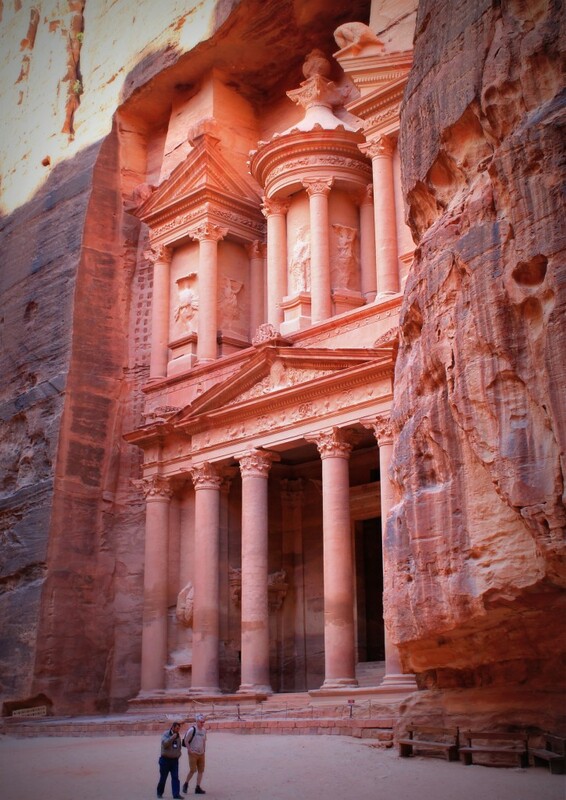 The next day we explore the charming Little Petra, a mini version of its larger cousin. There are very few people around and we climb the tight ravine to enjoy the gorge beyond, declining tea and trinkets from the old lady at the top. Heading south is a dramatic drive in desert landscape. First mountains, reaching the highest point in Jordan at Jibal al Batra at around 5,000 feet. We get just under a minute to admire the view before a coach full of noisy Japanese come thundering in to shatter the peace. Then we drop down to near sea level in scenes more reminiscent of Nevada and Utah. 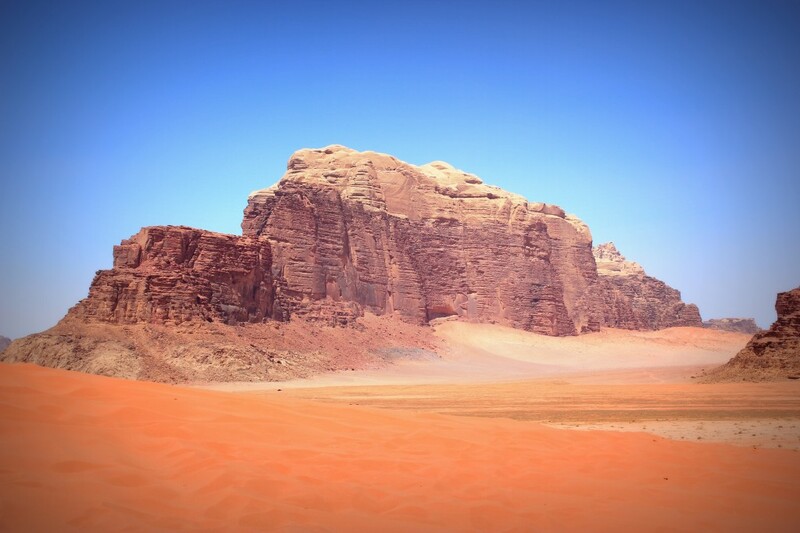 Mighty blocks of red rock intersperse rolling chaperal as we enter Wadi Rum, home of the Bedouin. Transferring to a battered old 4-wheel drive that our young guide has to hotwire each time, we visit a range of features in this harsh landscape: a spring originally found by Lawrence of Arabia, a narrow canyon adorned with ancient carvings, and a bright red dune, again silent until invaded by a horde of Japanese, all bizarrely wearing face masks in one of the least polluted places on earth. 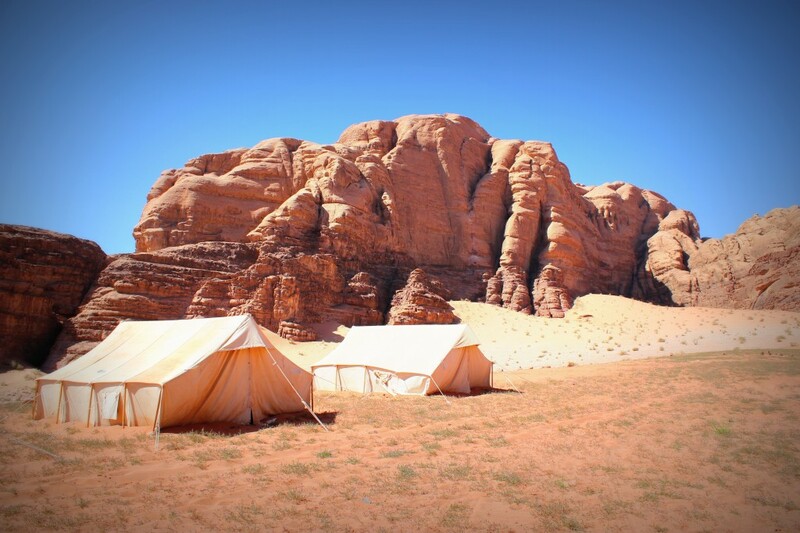 By mid-afternoon we arrive at Wadi Rum Camp – four tents nestling against the rocks in the lee of a large dune. A stroll around reveals various tracks – there are fennec foxes, jerboas and other creatures here – but we see little more than camels and the occasional dog. Sunset sitting on the dune is superb, and it’s the quietest night’s sleep in the world. Sunrise at 6am is just as good, and the moon is still up to partner it. Then it’s time to cram in once again to our fantastically rattly jeep and potter across the wadi back to Rum Village, whose main store rather brilliantly offers the ‘purveyance of rummage’. 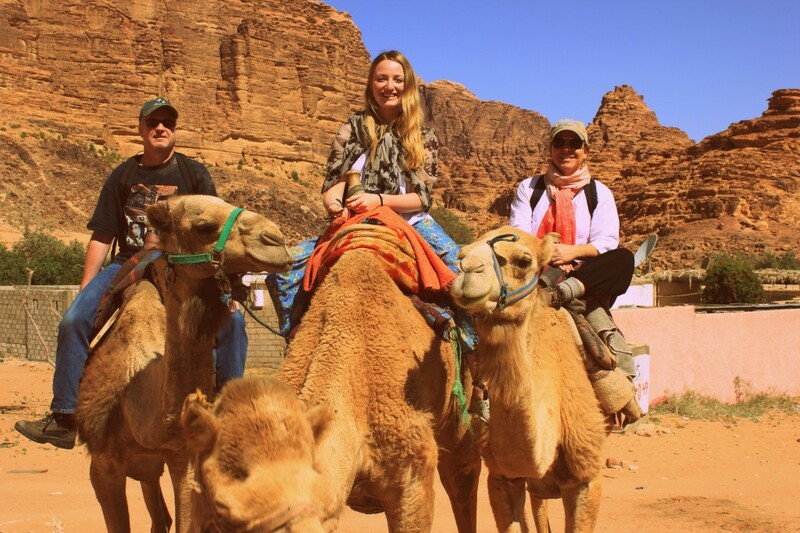 Here we mount camels and take a charming tour of the village and its surroundings, bumping into a range of children, locals, baby camels, goats, and all the other aspects of Bedouin life. They may look pretty weather-beaten, but they are a cheerful and friendly lot. 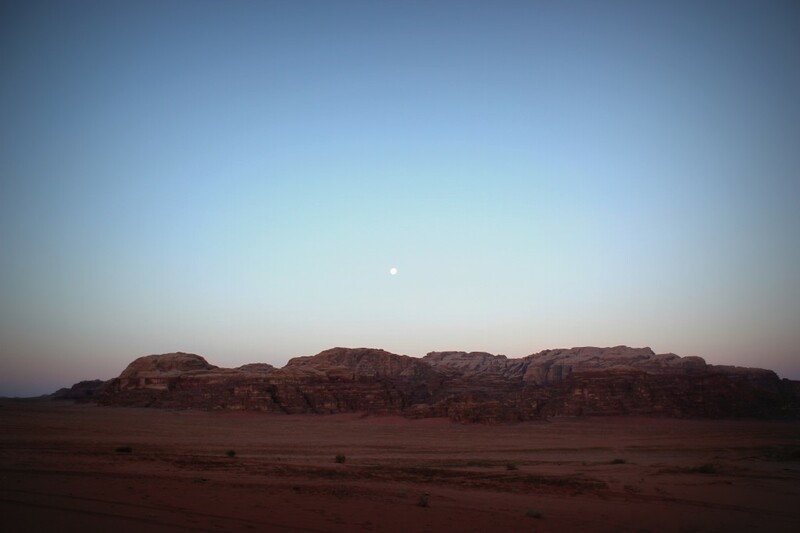 A one-hour drive out of the wadi takes us to Aqaba at the top of the Red Sea. This is a truly strange spot. It is the only piece of coast in Jordan – a strip of a few miles – and everyone piles in to get their piece of the action. It’s also a duty-free zone, which adds to the chaos. But there’s more. A total of four countries collide here. The bay is divided, with the other side being Israeli, as the Negev desert hits the sea at Eilat. The mountains in view behind that strip are in Egypt, and 20km down the Eastern side is Saudi Arabia. We are staying at the 200-room Kempinski, an elliptical structure with its own beach and multiple pools. It’s fully booked, and heaving with Russians and Scandinavians lording it up in the sun. Curiously though, all the revelry is taking place next to a harbour, and the bay is liberally dotted with tankers and cruise ships. Add in a regular traffic of jet skies, waterskiers and parasailers, and it’s hardly an idyllic scene. But no-one seems too bothered or regards it as unusual. Although tantalizingly close, we decide not to visit Israel for the day. You could go for lunch in Eilat but would end up with longish waits at both borders, and entry and exit fees in both directions. We opt instead for a mix of sunbathing, swimming and dining. The curious feeling generated by a backdrop of container ships never quite hits the spot, but it’s pleasant enough until the wind drops and a pervasive blast of oil from the docks lingers for a little too long. It’s time for some activity – tandem parasailing with my daughter Shaunagh. The equipment has come on somewhat since I was dragged through the shallows in Greece over 20 years ago. Now you just sit on the back of a powerful boat, the chute is filled at sea, the rope is released through an internal pulley mechanism, and you’re away. Winched in the same way straight back onto the deck, you don’t even need to get wet. On the final night after dinner I am approached by a good-looking woman in a red dress asking for comments on the hotel. It’s their job to solicit opinion but now is not really the time. It’s okay I say, but certain things aren’t great. There aren’t enough staff so service can be slow; construction work next door began at 9am on a Sunday; it’s expensive for what it is; the location is somewhat bizarre being next to a harbour. But it’s fine. The next morning we are up early for a 30-minute flight back to Amman, connecting to Heathrow. It’s delayed, with luggage and re-fuelling problems, but soon we are on our way for the 2,200 mile trip over Beirut, Greece, Bulgaria, Hungary and more. 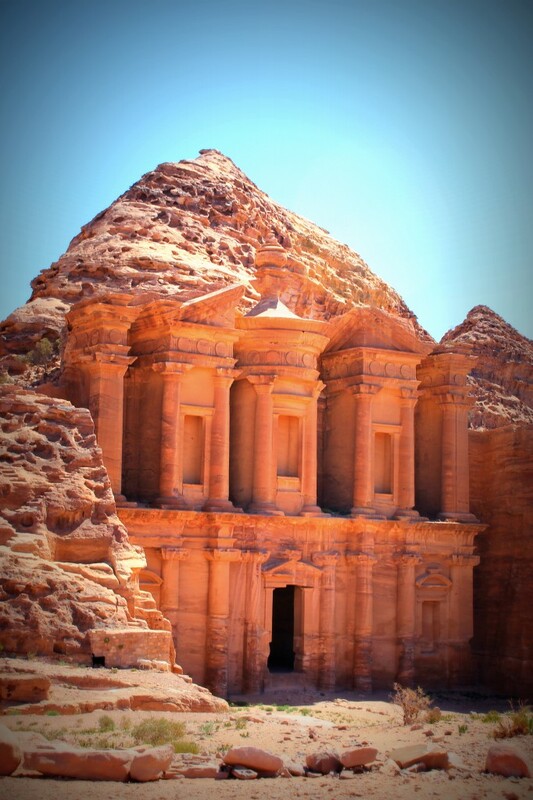 Reflections of Jordan? It’s amazing what you can pack into a week. The people are generally friendly, and a reasonably eclectic mix of Arab and Christian, so a fairly liberal approach prevails. It’s fairly expensive, particularly the alcohol, and they appear unapologetic about it. Infrastructure works well, with flights and cabs generally doing what they should. The real joy overall is the landscape. It is much more diverse than might be expected. There is plenty of sandy desert, but also fertile valleys and dramatic mountains and wadis. 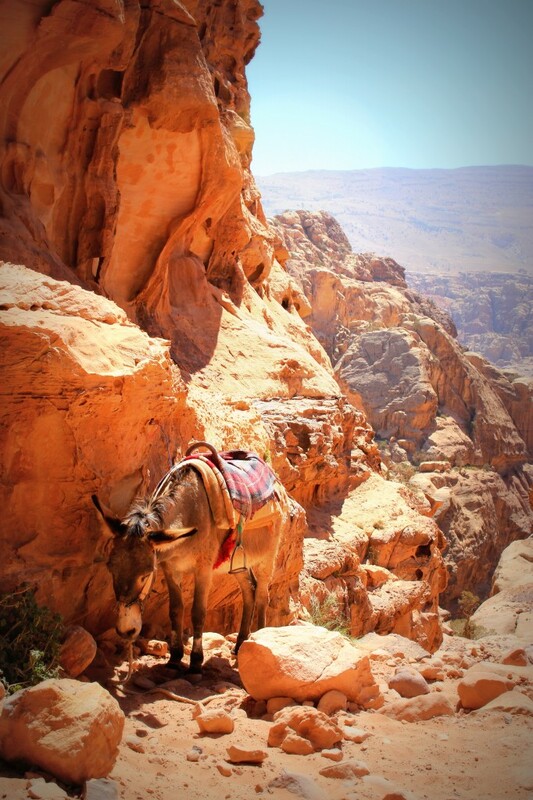 Wadi Rum and Petra are spectacular highlights, but the Red Sea is nothing to write home about.